In the winter of 2011 Andy Weis, former FOTW Director and Mickey Stone prepared a 25-page explanation of why we needed to renovate the trail system in the Hinesburg Town Forest (HTF). Material, labor, volunteer help estimates were configured in order to make Maiden, International and Dragon’s Tail have less impact to the surrounding environment and to make the trails sustainable for multi use users like; hikers, bikers, snowshoers and cross country skiers. This application and report needed letters of approval, intent and references as well as detailed labor and material estimates. It then needed to be tracked and documented throughout the building process. No small task to say the least. The process took approximately 40 plus hours between measuring in the field, writing the grant and collecting the intended approvals and needed letters to accompany the grant. The HTF between the years on 2005-20011 went through many political and environmental changes. The town of Hinesburg has seen a rise in population, home building and commercial businesses. The HTF for years was cared for and managed by a Town Forest Committee who we worked very closely with FOTW too install the original trails in the early years of 2000-2005. At that time we were looked upon as good stewards and keeping the impact to the forest at a low level. Before 2000 the forest was home to motorcross climbs, mud bogging like they have in Hanksville and regular 4-wheeler use for hunting, fire wood and recreation. All fun sports too, but that kind of use was really taking a toll on the hydrological, aquatic and trail system. Noise pollution, carbon emissions, garbage etc. littered the areas in and around the forest. So at that point, Steve Russell and the HTF committee allowed FOTW to go in sign, make new trails for people to use (non motorized) and to steward the land. This was when Hans Jenny (original FOTW founder) Brooke Scatchard, Chris Hill and Mickey Stone designed, laid out and cut in or raked the original trails. It was a fun creating time when Mtn Biking was still a fledgling sport. 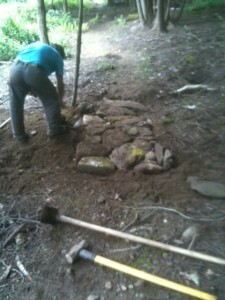 It was not uncommon to have 30-40 people a decade ago assisting on 8-10 trail days throughout the season. A special thank-you and acknowledgement of dedication for the work, drive and passion from Hans Jenny, Chris Hill and Brooke Scatchard for their imprint on the HTF. Hinesburg’s select board around 2005 added some more levels to managing the forest. They started a long-term logging, forest management and trail plans all to be done separately but connected. The creation of the Hinesburg Trails committee and the Hinesburg Town Forest committee were put in place to manage all of Hinesburg’s land use areas. During this time between 2006 and 2010 many residents, individual groups and committee members got involved with what is the real use for the HTF. So a ban on new trails was implemented until they finished their documentation, research and decision-making to how they would like to have the public use the land. There were some strong issues on a lot of fronts and the HTF was neglected during this time due to the controversy around it. Today FOTW works in conjunction with the Trails and Forest committee to ensure we as stewards are following thier management plan. You can go to the Hinesburg Town Office website to view the Forest Plan. www.hinesburg.org. Thus the reason to go for the RTP grant so we could get a jumpstart in order to get the forest back under control for bikers and hikers. Popular trails like Maiden and International looked like the pics below. The fall of 2012 we heard that we received the $20,000 grant and we started work in the mid summer of 2013. When Andy and I wrote the grant we wanted to repair and build stronger trust and relationships with the Hinesburg Trails and Forest committee. 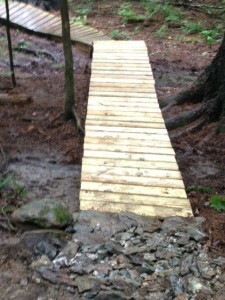 We did this by making International and Maiden accessible as our easiest loop in the forest. The trails were widened so people could see on coming traffic, bridges were constructed on Maiden so two people could walk side by side, most all roots were removed and the trail surface was dug down to the subsoil layer to ensure a hard surface. 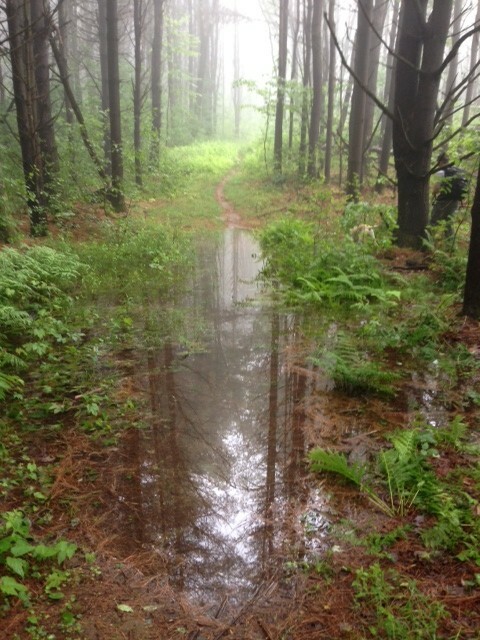 Trails were benched and water made not to sit on the trail but to be shed off of it. Every whole or water catching area was either armored or bridged over. Now here is where we have received a fair amount of constructive feedback, rightfully so I guess. Many users (mtn bikers) say we are dumbing it down, making it too easy and taking the thrill out of the trails. I guess we have! For good reason though! The entire trail network in the forest comprises of about 15 miles. Hayden Hill East/West parking lots are the main ones used for point of entry. When building a multi use trail system you want your easiest, most bomb proof loops down near the parking areas for hikers, families, novices, dogs etc. 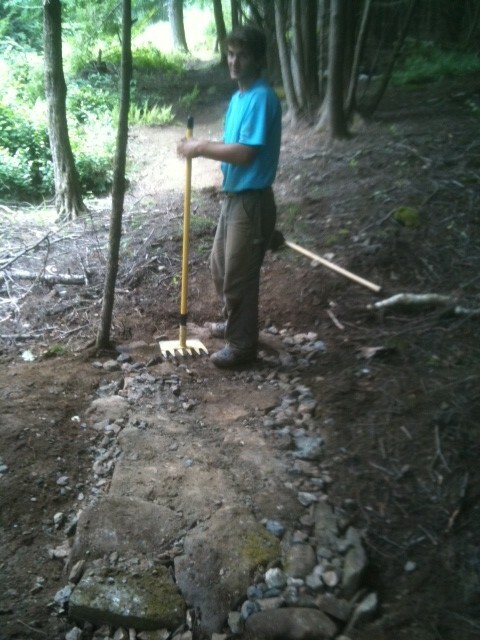 So our reasoning was to make these trails a bit more user friendly since they are going to be used the most. Plus these trails were not researched with the knowledge we have today they were just placed because it was a way to get up the mountain. During the grant we had to jump through many hoops. 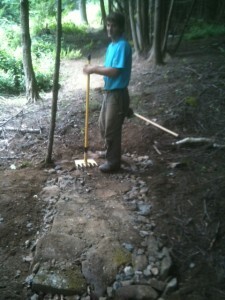 We had to agree to makes sure we did not upset clean water flow, that is why we bridged and armored all wet areas. 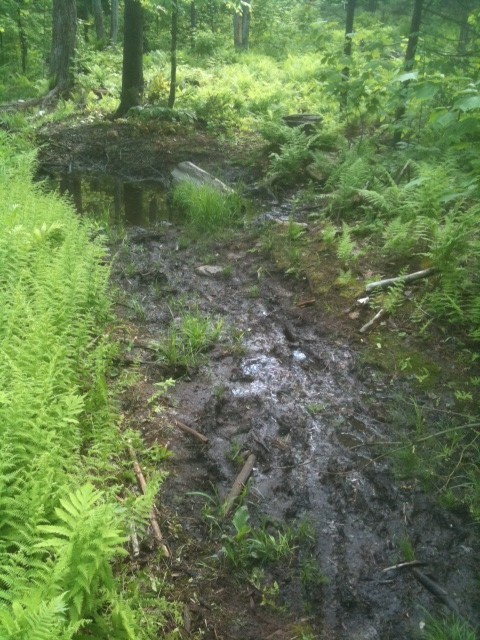 This is done so hikers and bikers do not constantly create a mud hole, which can clog water passing, add more sediment to the Texas Hill Brook and disrupt the natural fauna /flora and aquatic life. So each area we removed the salamanders, mudpuppies, aquatic insects to a nearby wet area and then went in and covered theses areas so water could flow freely. Not one crossing’s footprint was changed at all so to allow for the biotic life to continue and flourish. By not doing this you would have 100-foot areas that were mud holes. So the reason to bridge and armor other than being sustainable is done so the water flow is pure, low sediment seeps out and damaging aquatic life by biking or hiking through a stream is minimalized. 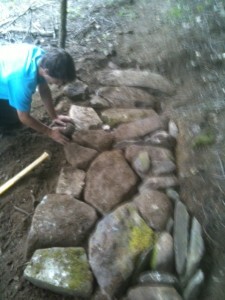 Below are some step-by-step pics of our crew armoring. 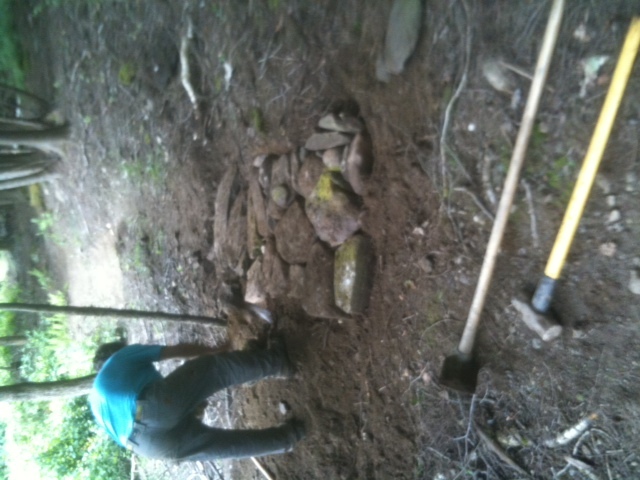 We prep the area by digging all the mud out, collect rocks nearby that are in the ground, pitch them (stand on edge) and place them so water can run threw, collect schist, sedimentary and crystallized rock and pulverize it to fit into the cracks and finally tamp it all down. This is much like what the Roman’s did with the slaves that created some of the first high tech trading routes. We call it roman roads on the trail. When the area in question is over 50-60 feet or goes over a deep dip or creek crossing we place a bridge with stringers, stakes and decking for human traffic to cross over the wet areas. We pride ourselves on making the entrance and exit to these bridges seamless and smooth so it is safe for the novice ability to handle. Maiden ends at Hayden West from the East parking lot and utilizes a natural bridge/dam/mill wall that was erected in the 1900’s. There are over 1000 feet of armoring or roman road sections in there and approximately 900 feet of bridgework. The entire trail is benched down to the subsoil and out slopped so water will shed all the time, truly a tremendous task to create for 1.2 miles. A big thank- you to all who volunteered last year on Maiden, commercial sponsors Dealer.com, Andy Weis, Josh Finklestein and Walt Silbernagel and of course our Board of Directors. Special thank-you to local stewards Chris Havland, Ian Carlton and Peter Hauserman. Hope you enjoyed the first part of the story and we hope it answered some questions and explained the scope of the work. Happy hiking and biking. Great work! Anyone who has ridden Maiden or International in the past should be able to recognize that this is clearly an improvement. Each of the benefits you list should be reason enough just by themselves. Riding through 6″ of mud like the pictures show, is technically challenging, but it is not fun! Waiting for days on end for the trails to dry is not fun either. What you have done should be commended, and is definately appreciated by this rider! Thanks Nick better to flow than mud away! We did a loop today starting at Sleepy Hollow and up and over Butternut area to HTF. 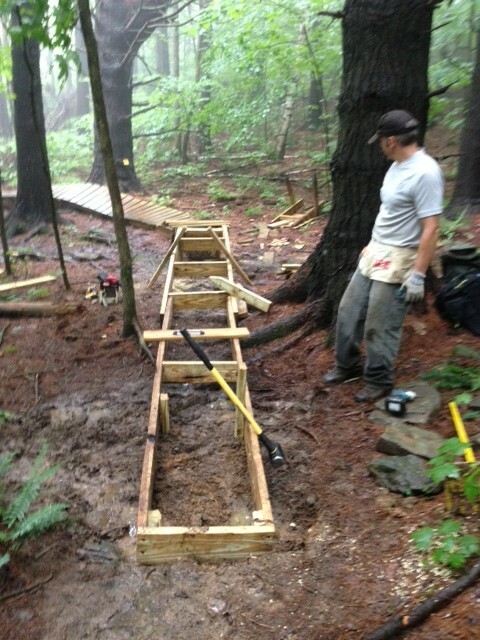 We noticed much new bench cutting over at Sleepy Hollow on Wookie and Balance Beam, nice job! We chose to ride Maiden based on your update……it was great! Last rode this area in 2011, what a difference! The bridges and roman roads really are an incredible sustainable improvement. Plan was to get over to Dragons Tail but the climb back up to Sleepy Hollow was on our mind so we took some advice from riders on the trail and gave Sheep Thrills a try….enjoyed it. Thanks for all the work the team has done. BTW….My daughter worked for you(Mickey) at SugarBush the winter of 2012-2013…it was a great experience. Ride On! Sleepy hollow has an high school intern putting in a trail and working in certain areas. Kudos to him. Thanks for this really informative blog and of course for all the hard work the crew does! My hat is off to you. During my conservation studies (I’m currently a junior), I have met some Hinesburg naturalists; they are passionate folk. To say you have embraced conservation at Hinesburg is an understatement as I was totally blown away by some of the work and I imagine it’s some of the finest in the country. It made me excited to see a mountain bike club embrace this stuff with such conviction. I love mountain biking in Chittenden County and our bike club kicks a**! Here I can be a conservationist and a mountain biker. As for disgruntled riders, lets see how many of them are hitting the big gap at Saxon!